I didn’t take Patty Murray’s budget very seriously. Indeed, I would have completely ignored the plan by Senate Democrats if it wasn’t for the fact that I felt compelled to debunk her mythology about the 1990s. America’s political cartoonists are similarly underwhelmed. 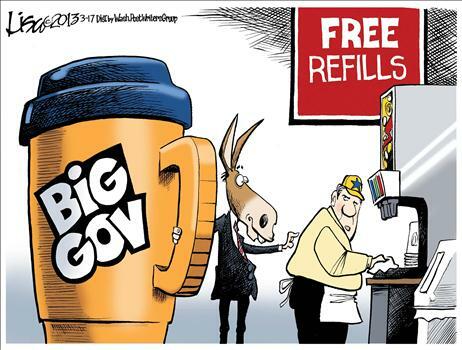 A great cartoon because it recognizes that the problem is bloated government, not red ink. Steve Breen also is not impressed. 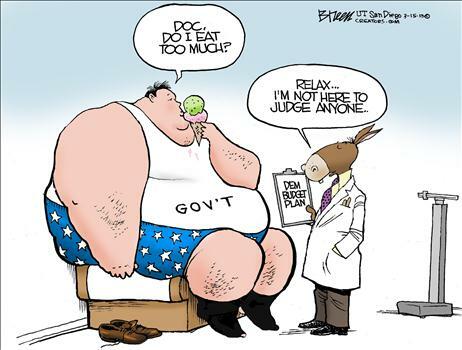 As you can imagine, this might be my favorite of the group because I’m a sucker for cartoons portraying government as an obese slob (see here, here, here, and here). 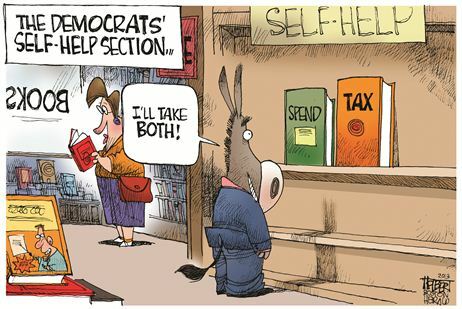 Last but not least, thisJerry Holbert cartoon also is worth sharing. Again, this cartoon correctly focuses on the main problems of punitive taxation and excessive spending, not the lesser symptom of too much borrowing. It will be very interesting to see what we get (from both a substance perspective and humor perspective) when the White House finally decides to issue its budget. That budget was legally required back on the first Monday in February. Based on what we saw last year and the year before that, I’m not holding my breath expecting anything more than another tax-and-spend blueprint. And as this Michael Ramirez cartoon illustrates, we know where that will lead. Or take a look at this Glenn Foden cartoon. Different theme, but same restult. I read that President Obama in his meetings with the Republicans would not even say that a balanced budget was a goal. According to the budget presented by the Democratic Senate he is in agreement with their approach. Dan I know you have also said that a balanced budget is not a goal but for a totally different reason than Obama. Obama doesn’t want to limit government spending ever and you want to reduce the size of government spending!!!! WHO DO YOU THINK THE FOUNDING FATHERS WOULD HAVE AGREED WITH? Funny cartoons about a serious subject.